Hello! 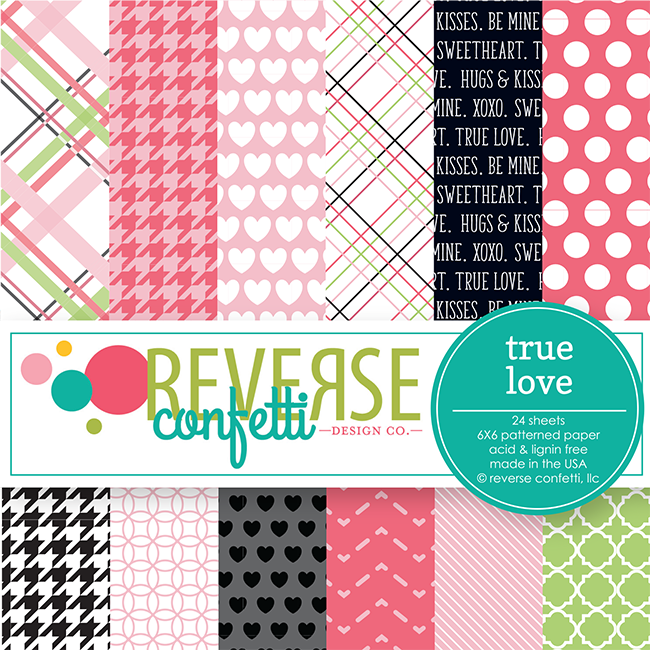 It's the first day of Reverse Confetti January sneak peeks, and today I'm sharing a card created using the new Cured stamp set, and the Tall Stripe Confetti Cuts and Heart Banner Confetti Cuts dies. Once the images were dry, I die cut them with the coordinating Cured Confetti Cuts. One of the sentiments from Cured was then stamped in black ink onto a strip of Lime Green CS. The sentiment strip and piggy were then adhered to the card front with foam tape. Next, I used the Heart Banners Confetti Cuts on Piggy Bank, Lime Green and Stone cardstocks and assembled the pieces together. The die cuts were then strung together with Charcoal Twine and adhered to the card front with foam tape. To finish up, I embellished with light green pearls. Oh Heather, this is stinkin' adorable! Over-the-top Valentine cute times 10! 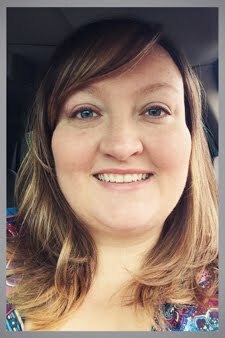 Ok this is too cute, Heather, love the pigs "crown" lol! How darling... I'm loving these designs so far! How could anyone not love this sweet card? I'd been looking at the small piece with the piggies and thought it could b a crown, great to see it used that way! Pink and green, ahhhhhh. What a sweet little card. The banner is a perfect touch! Such a sweet card. 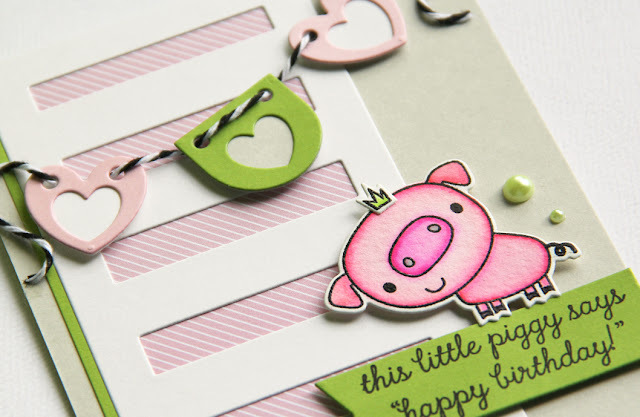 Love the layers, colors and cute pig. So fun! 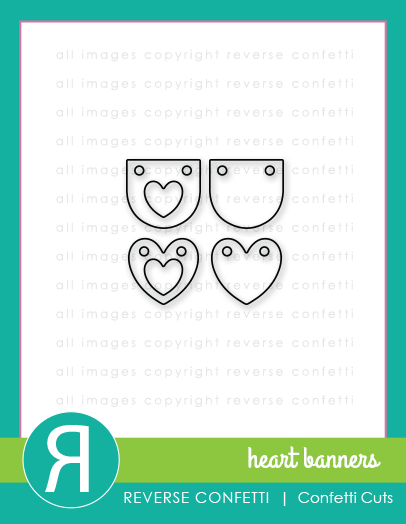 I love these pretty heart banners! They make your card look amazing and cute! It looks like you cast your pearls before swine on this card. What a cute touch!!!!!!!!! Fabulous design with those sweet products! Beautiful creation Heather. I sure love that piggy set. Love your cute, little heart banner. Can't wait to get that patterned paper. So cute. I like the colors and the card design. I just LOVE these little piggies!!! The cutest ever! Love this sweet card! Cute card and I love the new colors and designer paper stack. Adorable piggie and love the banner. Your card is so sweet! Love the heart banner. The lime and pink combo is so fun! Sweet Valentine design! 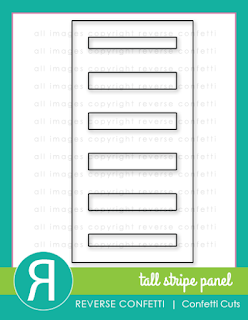 The heart banner sets off that tall stripe panel perfectly. Love this design! 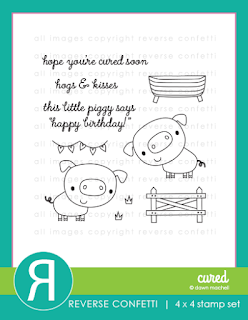 What an adorable card, love the colors and that cute little pig! 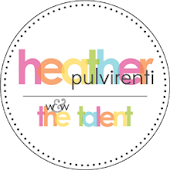 Hi Heather, I think your card is amazing. The heart banners are perfect. I also love the patterned paper and your card layout. Thanks for sharing. This is so cute! 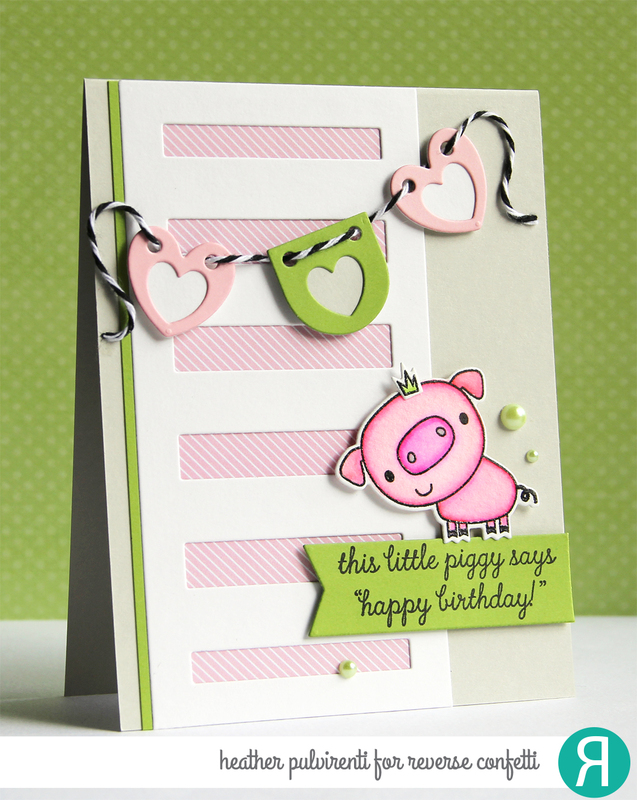 I love your color palette and that cute little piggie! So sweet. I love pastels. And I Love the new "cured" stamps and dies. Just precious! Oh my heart, Heather! This is beyond adorable, and I can't believe how sweet it is. You really did a fabulous job showcasing these sweet new goodies. Thanks for participating in this SUPER inspiring hop. Wow Heather! I love this sweet card! Absolutely adorable! Aww - this is super sweet! I love the colors you chose and the banner is just the sweetest thing ever and that sentiment made me melt! Heather your card is so adorable!! 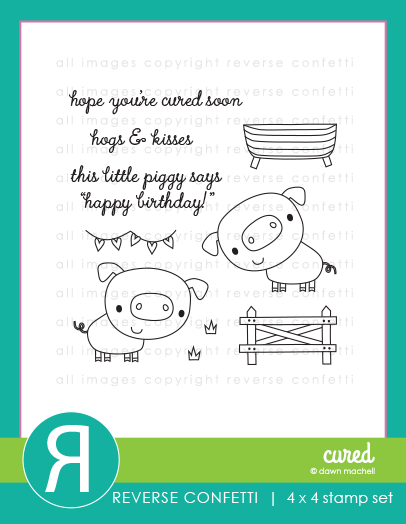 The little piggie is just too cute ❤️❤️ I'm so in love with this new stamp set. And the sentiment is so sweet!! Love your birthday card Heather! 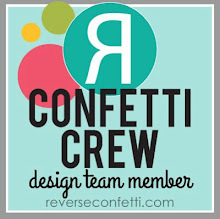 Your banner rocks! 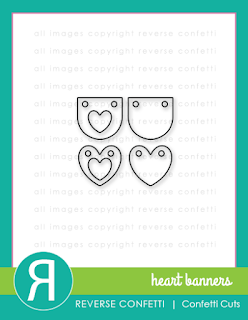 Love the heart banner...this would come in handy for an upcoming wedding card I would like to make. I love this sweet little piggy! The heart banner is a must-have for me! That is such a cute piggie and that cute "crown"!! Love the banner of hearts.